Growing in full sun to part shade Westringia glabra may not be as commonly used as some of the related species, however it is an attractive and useful garden plant. Reaching 1m + in height and with attractive deep green foliage the lilac flowers that appear in spring to summer contrast well. A little more open growing than some, new growth of can be pinched back to help create a more bushy habit. 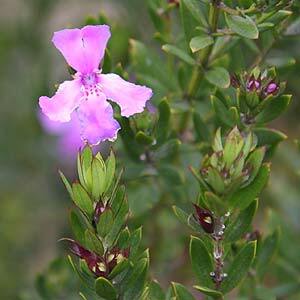 As a small shrub in a native garden or border, or as a low growing easy care hedging plant. As a hedge plant at around 80cm apart for a dense hedge. Westringia glabra grows well in part shade as well as protected coastal conditions. W. glabra ‘Deep Purple’ – Darker purple flowers than others. Drought tolerant once established Westringia glabra could be used in the native garden, or as a low growing hedge. Excellent for coastal conditions. Prune lightly after flowering to maintain a dense bushy habit. Use a low phosphate native plant fertilizer in spring. Mulch lightly around plants to maintain a cool root run. Water during long dry summer spells for best performance. Could also be grown as a container plant, however may require more water in these conditions. Light regular pruning is best. The best time to prune is after flowering. Country of Origin – Australia – NSW to Victoria in coastal areas. Climate Zones – Tropical to Warm Temperate, naturally growing in rainforest areas. Soil – Tolerates a range of well drained soils, including poor coastal soils. Spread – Rounded shrub to 1 metre plus. Flowers – Purple to Violet. Flowering Time – Almost year round.